After the huge success of the last Star Wars themed Family Sundays event, the Australian Centre for the Moving Image (ACMI) invites your brood to join in with the next family fun day this June. Family Sundays: Get into Gameplay is on Sunday 4 June and will see a face-off with family and friends on the brand new Nintendo 1 2 Switch. Show off your Mario Kart skills and get down with Just Dance on the giant screen! Tap into your creative side, while you paint and draw a masterpiece in virtual reality with Google's Tilt Brush, and journey into the human body or experience a prehistoric Jurassic adventure in the VR Playzone. For all your mini Pokemon fanatics, catch 'em all with mask tutorials, colouring and Cubecraft, as well as designing and bringing your own Pokemon creature to life through basic coding. Don't stress if you're new to coding, ACMI's tech experts will be on hand to help you out. Lastly, conquer your crew with giant versions of classics like Connect 4 and Snakes and Ladders. Best of all? 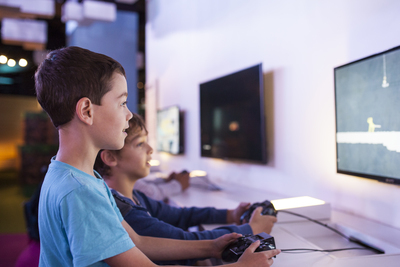 All of the above activities at ACMI Family Sundays: Get into Gameplay are completely free. That's right, no cost, just fun times.